The 4-week-old puppies were too small to be without their mom, but they’d helped each other survive on the streets, sharing scraps of food whenever they could find them. 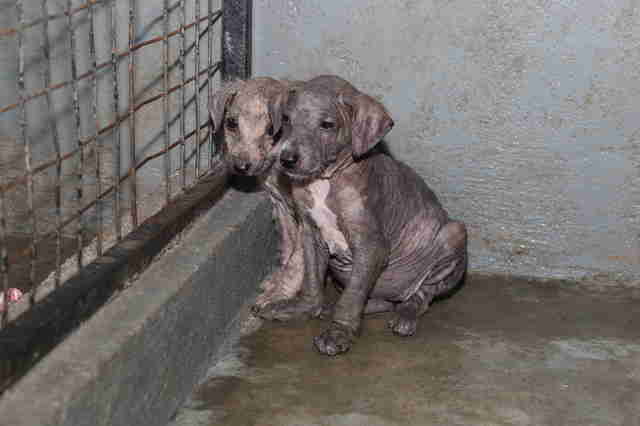 Last November, the team at Embark, a group that rescues and rehabilitates Sri Lankan street dogs, got a call on their hotline about the two hairless puppies seen wandering the streets near the University of Jayawardenapura in Colombo. The puppies appeared to be sisters, but their mom was nowhere to be seen. A rescue team immediately went out to help the puppies, whom they named J1 and J2, but capturing them wasn’t easy. Once they were caught, the rescuers immediately whisked J1 and J2 off to the vet. 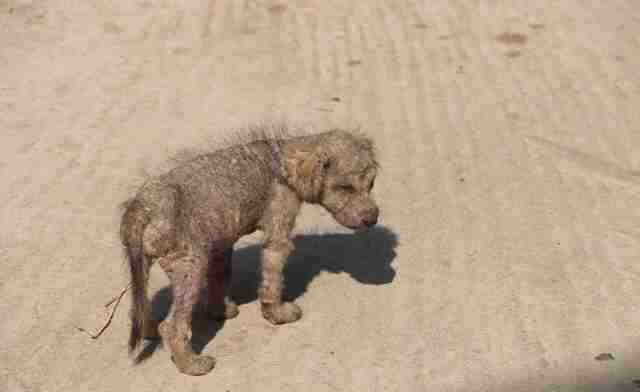 Both sisters were suffering from tick fever, anemia and mange, a skin condition that results in hair loss. J1 was also limping from an injured leg. 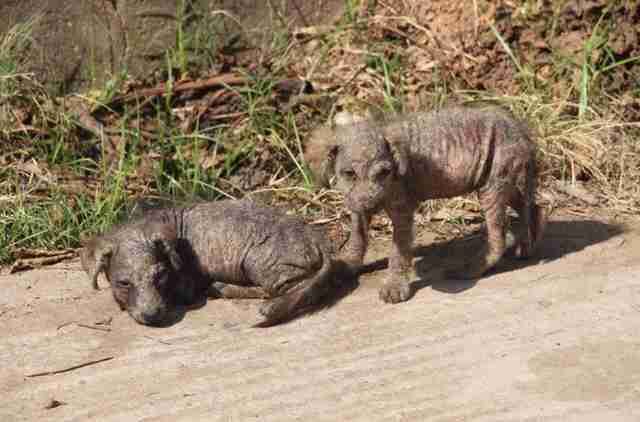 But the rescue team never doubted that the puppies would recover. “We knew that they were strong since they’d already survived the harsh conditions of the streets,” Suraweera said. Getting J1 and J2 to trust people, however, was a different story. But with time, the puppies realized they were in safe hands, and they started to seek out attention from people. They also had a lot of fun playing with the other puppies at Embark’s rescue center. “Soon these two girls learnt to love again, and their playfulness started to appear after about three weeks in our care,” Suraweera said. Once J1 and J2 had fully regained their health, they were put up for adoption. However, the Embark team wasn’t sure if they’d be able to find a home together. But in February, the perfect family turned up. Whenever the Embark team places rescued dogs into new homes, they make sure the new owners won’t chain the dogs up or put them in a cage, and that they keep their dogs’ vaccinations up to date. But it was clear that J1 and J2’s family would take wonderful care of them. “We are very happy that J1 and J2 are safe and happy in their forever home with the people who love them,” Suraweera added. 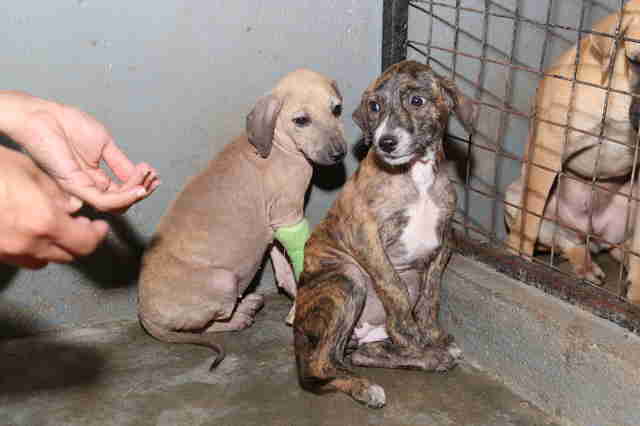 While J1 and J2 were lucky to be rescued, as many as 3 million dogs are still living on the streets in Sri Lanka. Some dogs are deliberately dumped by their families, but there are also native Sri Lankan dogs who have been living and surviving on the streets for centuries, similar to the Balinese street dogs in Indonesia. Historically, these native dogs have been able to survive on streets, but urbanization has made things harder for them, and many end up starving, getting sick or becoming victims of animal cruelty. 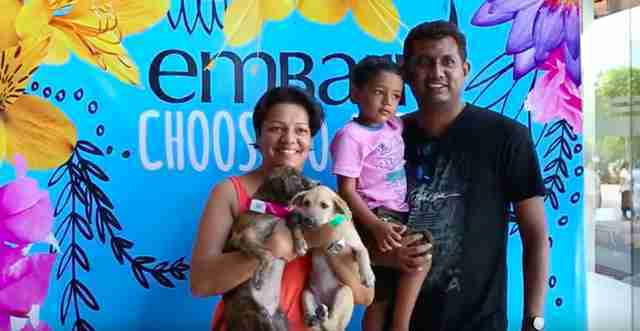 Embark is one of many organizations working to help streets dogs in Sri Lanka. Besides rescuing ones having trouble surviving on the streets, they also operate sterilization and vaccination clinics, and run educational programs to teach the public about the native Sri Lankan dogs. To help Embark rescue more dogs like J1 and J2, you can make a donation.